Rubber Stamp "I Love you not only for what you are"
Staz On stamp pad "Black"
Archival Ink stamp pad "Jet Black"
Brilliance Dew Drops stamp pad "Pearlescent Lavender"
From top of card my first 3 rows & bottom row were approx 3/4"h. The large square is approx 3.5"w x 3.5"h, the other score lines just fell into place. Take care when scoring not to over shoot your lines, so that one score ends at exactly the edge of another line. To make decorative paper for strips, place your glossy side of paper facing up on our work table. Put several drops of both the plum and denim on your felt tool. Pounce your tool over your paper. Then put some gold and pounce, add blender and pounce, working your paper until you get the results you want. Note: the more saturated the felt is and the quicker and surer you do your pouncing, you will get more of the beautiful blotch and spider patterns. (Just be careful not to overload your felt or you'll get puddles that will take a while to dry). Also pounce an area, let dry a few minutes before pouncing in it again, will give you nice variations in color and more of those dark edged areas When the felt is almost dry continue to pounce on your paper and you'll get little waves interspersed in your big splotches. Cut strips to fit some of your rectangles, Attach with double sided tape. 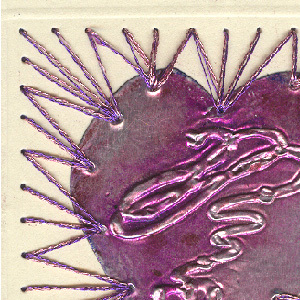 Make a sculpey mold as per package directions and impress your "Flourished Heart" rubber stamp. When baked and cooled, press silver paper, silver side down, into mold, using the back of an eraser on a pencil or other soft tool to get into the crevices of the mold. Color the silver tape with some of the alcohol inks, wiping away excess, so you still have some silver showing through. Remove backing paper from adhesive and stick to card. Use the tip of an awl to pierce holes in the edge of your large square and the edge of your heart. Split your thread into 2 ply sections and thread your needle. Create a pattern by going into the same hole in the heart while going through holes around square only once. Tape ends of threads to inside of card (when done, remove tape and glue thread ends neatly). 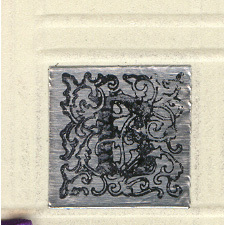 Rubber stamp your letter "B" onto the small piece of silver foil with StazOn "black" stamp pad, heat set and glue to card. Mark holes evenly spaced for the 5 little heart brads. I used my awl to punch the holes. Spread the tails on the inside of the card and lightly hammer down flat. 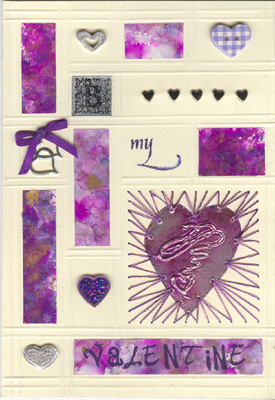 NOTE: Stamp your word "Valentine" either before or after gluing background paper to card, using various alphabet letters and the Brilliance Dew Drops "Pearlescent Lavender" stamp pad, and Amethyst embossing powder, heat set. Inside of the card I used the Black Ink decorative paper attaching half the page to the back of the front page, hiding the brad tabs and thread ends. 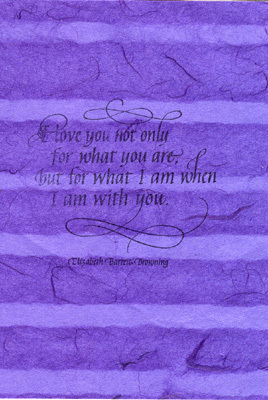 On the other half I rubber stamped the quote "I Love you not only" with the Archival Ink stamp pad and heat set.